21 Choices is a froyo "chain" ... of only two stores, that I discovered in Pasadena, CA. It is also the best froyo I've ever had. And I've had a lot of froyo. 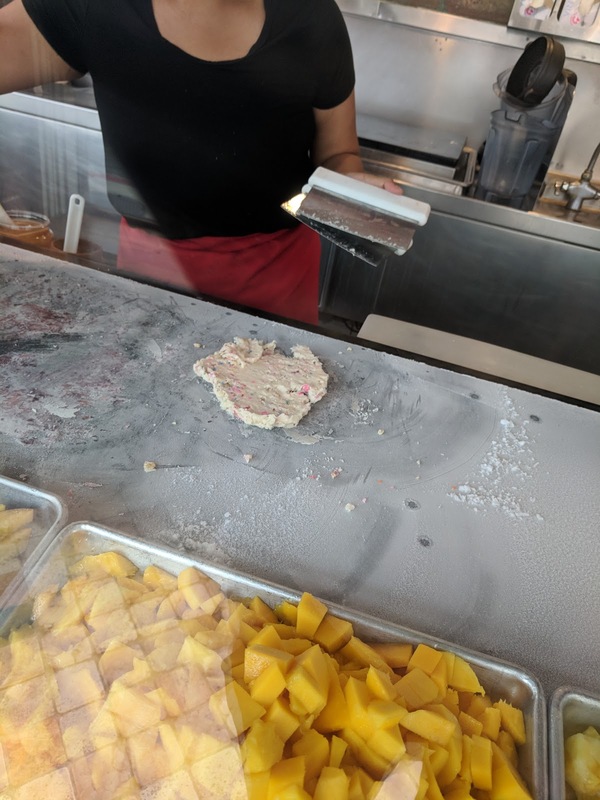 They make the frozen yogurt in house daily. It is soft serve. But not like any other you have had. They have two different concepts, and both are amazing. Trust me. 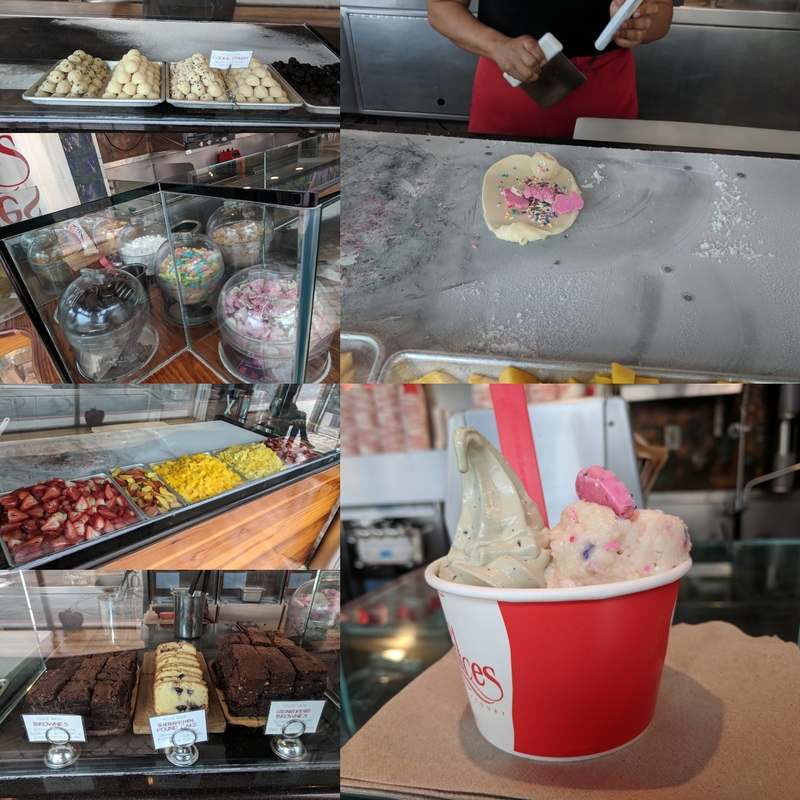 I experienced both sides of 21 Choices - a made to order Mix-In (a la Cold Stone) and a pre-made "Today's Choices". Everything about the experience was incredible. 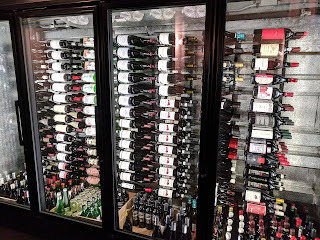 I was in Pasadena for 2 days only, and went to 21 Choices 3 times. Yes, that means I went after both lunch and dinner one day. Don't judge. It was amazing. 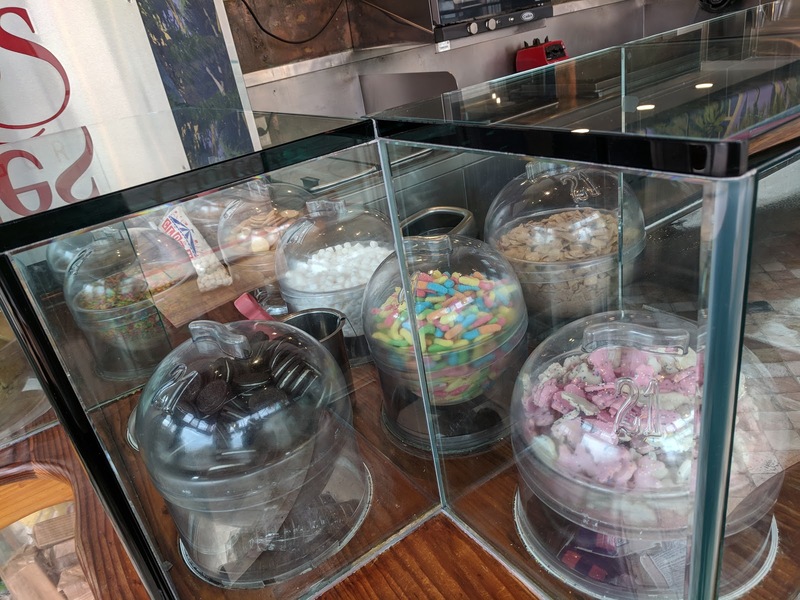 21 Choices is found on a corner of Colorado Boulevard, right in Old Town, just a block away from other froyo places like Yogurtland, and a number of local ice cream shops. 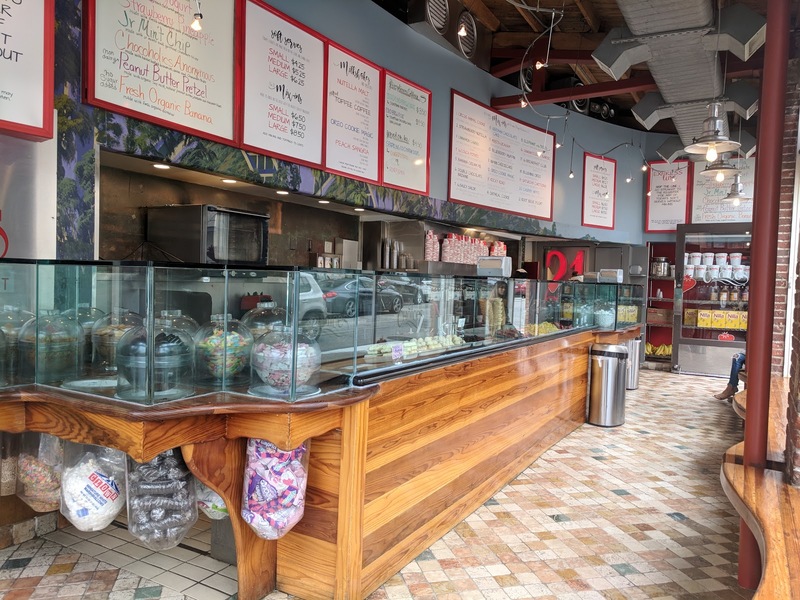 The store layout is pretty simple: one long counter, behind which all the toppings and soft serve machine are located. Menu boards span the walls above. There are no tables for seating, not inside nor outside, but along the window there is a bench where you can sit. The place gets *really* busy in the evenings, but I was there right when they opened, and had the place to myself the first time I went. 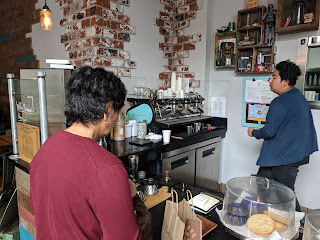 On all my visits, the staff were incredibly friendly, offering samples the moment you walk in. They *want* you to sample. They offer more and more. "What else you wanna try? ", they prompt, before you even ask. Its incredible. Even when the lines get longer, they offer up the samples to start. They ask you to sample your creation as it is made. Incredible service. 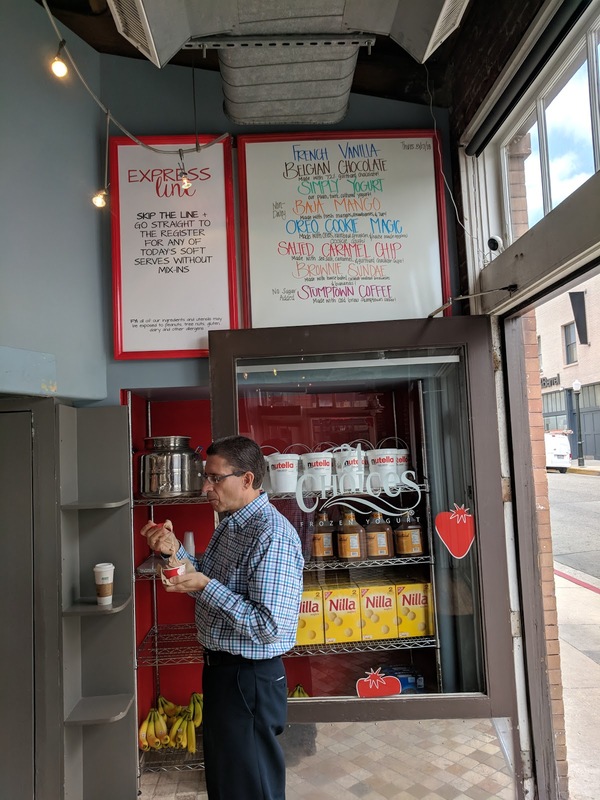 If you are in a rush and just want a quick item though, you can go straight to the Express lane, to get a simple yogurt, check out, and pay quickly. 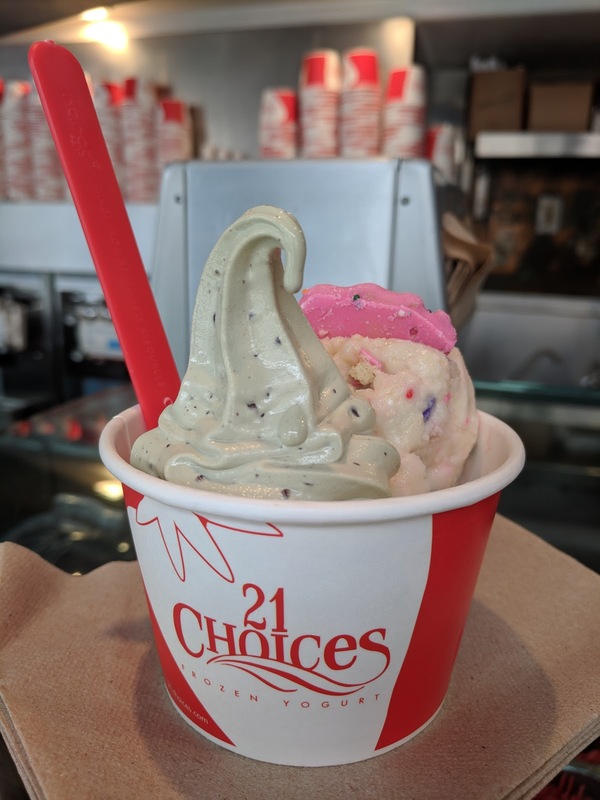 So, yes, 21 Choices is a froyo shop. But it isn't like any other froyo shop I've ever been to. Not only is it not self-serve, pay-by-weight, etc, its more like Cold Stone, where they make it on a cold slab with your choice of mix-ins, but, it is soft serve yogurt. Or, it isn't. It can also just be incredible pre-made flavors of soft serve, with or without toppings. Or milkshakes, etc. Many, many choices, and the 21 Choices actually *only* refers to their 21 suggested mix-in versions. That is in addition to the 8 flavors of the day, and once you add in the ability to create your own, etc, seriously, limitless choices. So, starting with the froyo bases. Belgian Chocolate: "Made With 72% guittard Chocolate." Simply Yogurt: "Made with our plain tart cultured yogurt!" You can get them in a cup or cone, Small for $4.25, Medium for $5.25, Large for $6.25. You can have multiple side by side if you want, or swirled if on the same machine. You can add any toppings too, for $0.75. If there is a line, you can skip the main line, and go right to the cashier, to have this served up without a wait. Of these, I tried only the French Vanilla, curious how it was on its own, before using it as a base for a Mix-In. 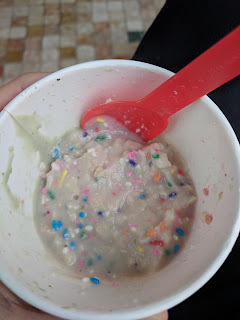 It was my least favorite - actually a bit icy, not nearly as creamy as any others, and seemed most like, well, froyo (the others really were much more like ice cream). And then, the other 5, which change completely every day. Some are pre-made versions of the signature 21 Choices, but many are not. As they told me, "it just depends what the chef wants to make each day!". I adore that they 1) call them chefs and 2) let their staff have so much control. The options always include at least one non-dairy option (sorbet or soy milk base) , and one no sugar added option. (Non-Dairy) Baja Mango: "Made with fresh mangos, strawberries, and 7up!" Oreo Cookie Magic "Made with oreos, (eggless) cookie dough, and rainbow sprinkles!" Salted Caramel Chip: "Made with sea salt, caramel, and guittard chocolate chips." Brownie Sundae: "Made with house baked coconut-walnut brownies & bananas!" (No Sugar Added) Stumptown Coffee: "Made with cold brew Stumptown Coffee!" 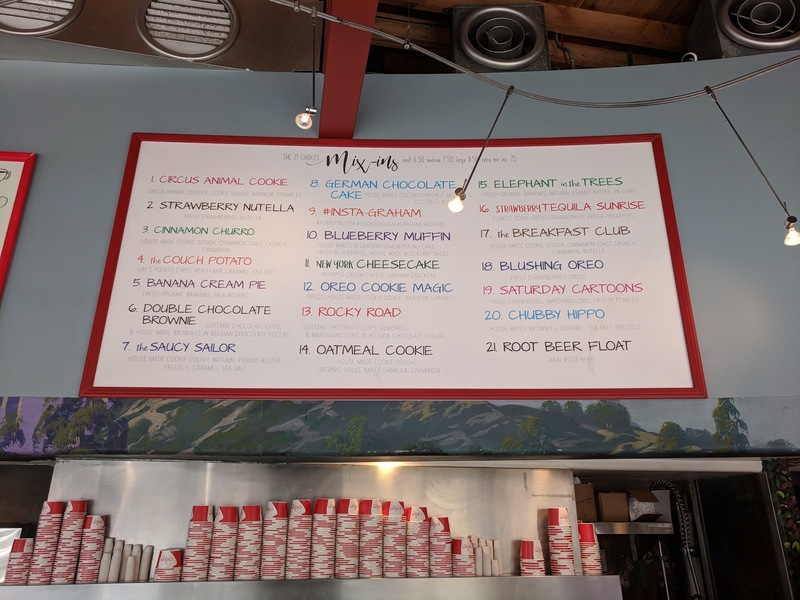 Of these, only the Oreo Cookie Magic was a repeat from their 21 Mix-In Versions (and of course, you could opt to have it freshly made that way if you prefer). 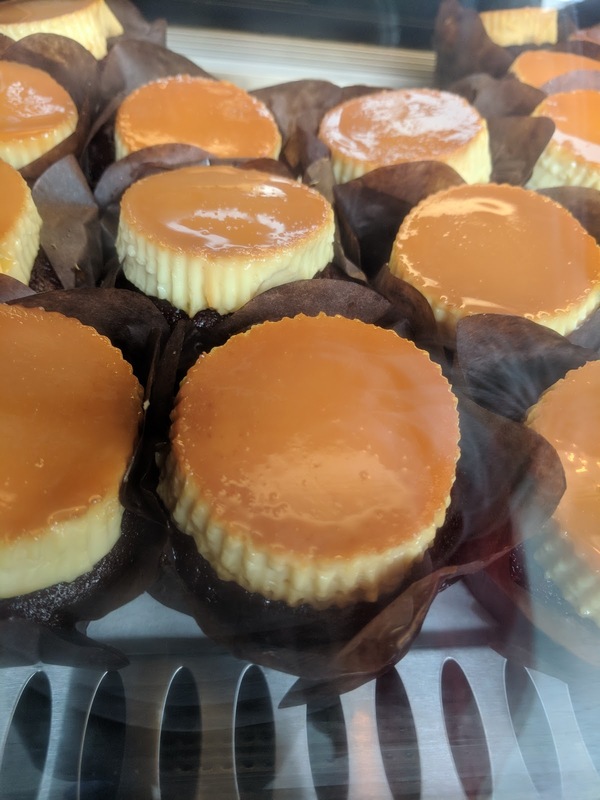 I tried two, and was blown away by the creaminess and consistency. It was perfectly creamy, not distinguishable from ice cream. 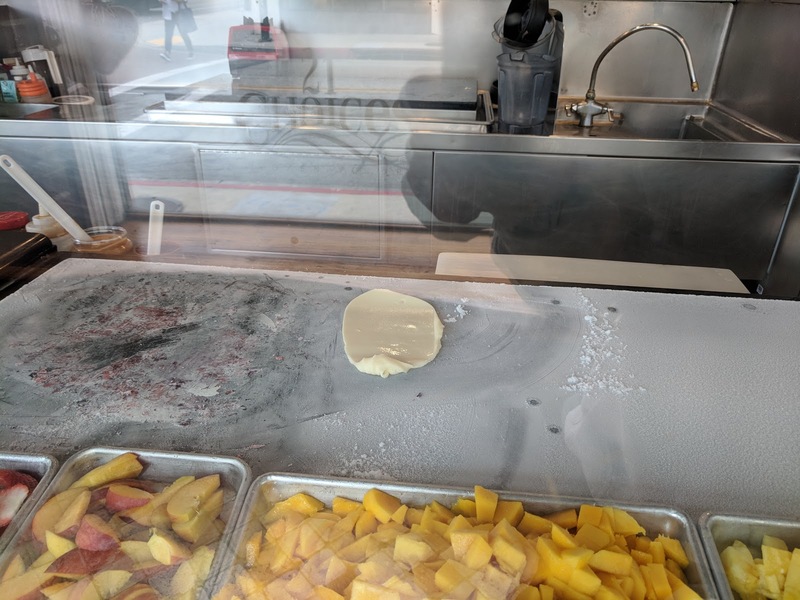 How was this frozen yogurt? How did they get the mix-ins so perfectly integrated, and served from a standard froyo machine without clogging it? I've never seen anything like this before, and it was mind-blowing. (Non Dairy) Strawberry Pineapple: "Made with fresh strawberries and pineapples." Junior Min't Chip: "Made Guittard chocolate chips and Junior Mints." Chocoholics Anonymous: "Made with house baked brownies, Guittard chocolate and Oreos." (Non Dairy) Peanut Butter Pretzels: "Made with natural peanut butter, organic soy milk, Guittard chocolate chips and pretzels." (No Sugar Added) Fresh Organic Banana: "Made with fresh organic bananas." These were all originals, none from the 21 Choices menu. I tried several, and again, was hooked. I was happy *just* with the froyo, it was that good. I didn't need toppings, not even sprinkles. I didn't need to create my own thing. I never expected that, but the creaminess and texture from mix-ins was just remarkable. But still, there were many, many more options. Starting with the toppings, available on top the soft serve, or inside Mix-Ins. Fruit: Strawberries, peaches, mango, pineapple. First up, fresh cut fruits. This was just part of the lineup, there were blueberries, raspberries, and more in the next section. 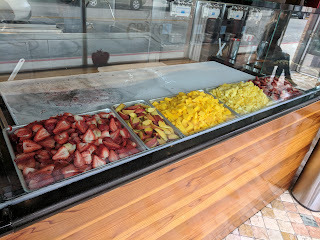 I didn't try any fruit but it looked decently fresh. Fruit not your style? How about the other end of the spectrum: cookie dough! 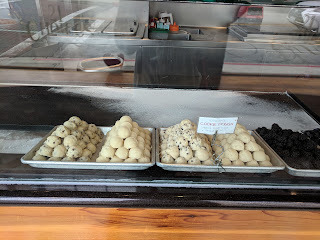 Several varieties available, very large balls (which are chopped up when used in Mix-Ins, or just perched on top as a topping). I think they had a non-dairy cookie dough too. The cookie dough was a highlight for me, buttery, soft, delicious. Giant globs of cookie dough not enough? 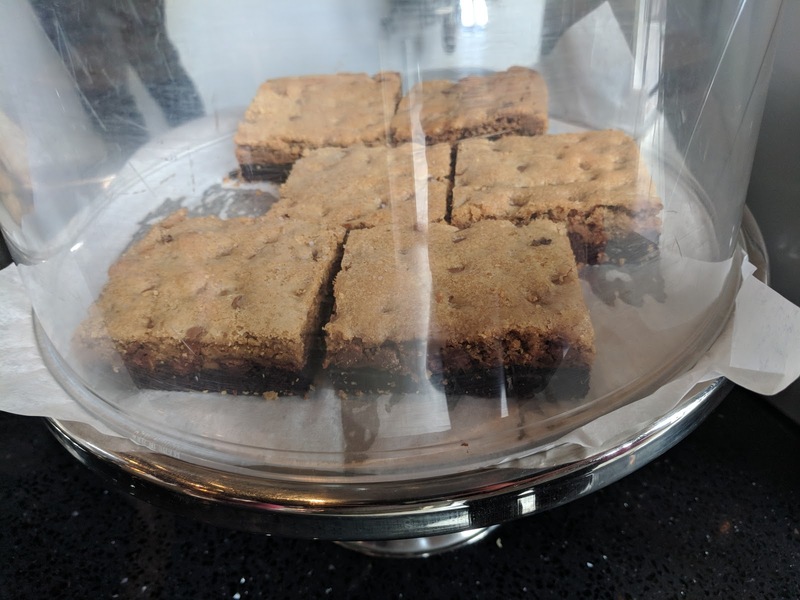 How about house made brownies (with or without nuts) or blueberry lemon pound cake. Yes, those are Mix-Ins, not individual baked goods you can buy. And yes, if you opt for a brownie or pound cake, you get the entire thing chopped up inside. Crazypants. And then, the globes. Full of assorted toppings. 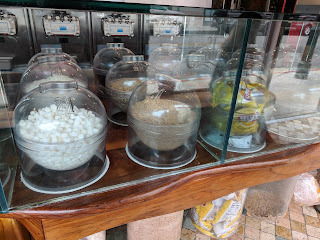 These ran the gamut of basically everything, your standard ice cream/froyo toppings of assorted nuts, cereals, candy, etc, and some more unique ones like the Lay's Potato Chips and pretzels. These globes went on and on, on both sides of the ordering station. Globe Close Up: Circus Animals. 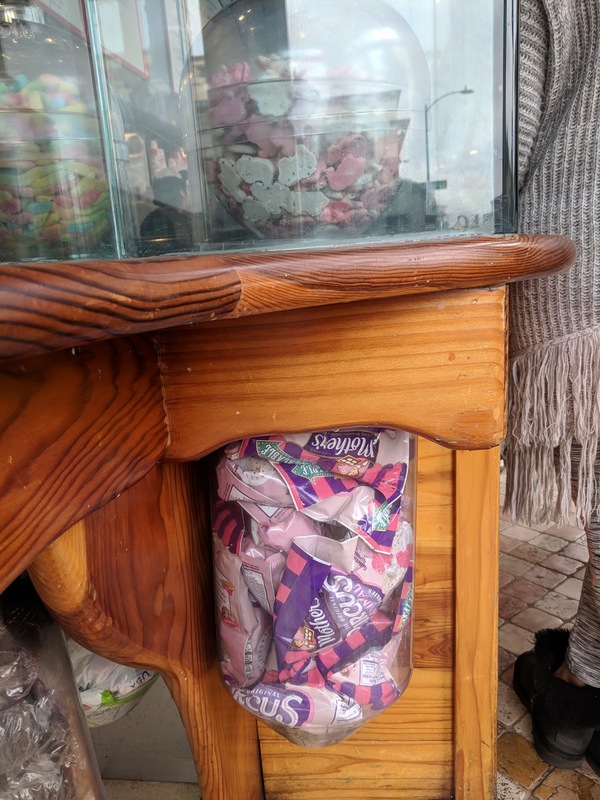 Each globe had the easily accessible and visible items up top where the server would take from, but then down below in the tube was the stash of extra, which also showed you what brand they were. So, yes, the more novel section of the menu is the Mix-Ins. Made to order like Cold Stone, e.g. on a cold plate, with a base froyo, then toppings chopped up, and mixed in. The 21 Choices of pre-defined Mix-Ins. The menu board suggests their namesake 21 Choices, each of which sounds pretty amazing, and well crafted. Of course, these are just 21 Choices that are suggested, you can make any custom creation you want, picking any base, any Mix-Ins. Small is $6.50/Medium $7.50/Large $8.50, with additional mix-ins $0.75 no matter the size. But the sizes are large, I've heard the large is actually a pint! Once you order a Mix-In, your server springs into action. First up, they serve some froyo from the machine, like normal, a swirl in a cup. Then they dump it on the cold slab, and flatten it out. Next, the toppings get added. Here you can the generous pile of whole circus animals, a big ball of cookie dough, and rainbow sprinkles that went into my mini size. Chop, chop, chop, and, suddenly, a totally different creation! As she finished, she got out a spoon, and handed me a spoonful, "Here, taste it, let me know if anything needs to be done differently". I wasn't expecting this, but they did it for every guest. I did see one lady ask for more peanut butter, so, I guess it works! So, after all that, what did I get? I was having an incredibly hard time deciding. I really, really liked the soft serve flavors direct from the machine that I tried. But ... I felt like I *should* get a Mix-In. I told my server which two things I had narrowed down to, and she said, "Why not just get both, as a side by side?" Amazing. So I got half a Mix-In (from their 21 Creations) and half just a pre-made one from the machine. Charged as if it were all a Mix-In, which was fine with me. I opted for the off-menu "Tres Small", which I knew existed from my research, even though not shown on the menu boards. It was plenty big. Junior Mint Chip & Circus Animal Cookie Mix-In, Tres Small. The flavor I picked direct from the machine was the Junior Min't Chip. It was really crazy good. Soooo creamy and smooth, lovely mint flavor, amazing texture from the bits from the chips and chopped up Junior Mints. Seriously, perhaps the best froyo I've ever had in my life, and certainly the best version of any mint choc chip of any kind. Seriously amazing. I do kinda wish I had just stuck with this, maybe with a topping. But I also wanted to experience the Mix-In, so I went for the Circus Animal Cookie, drawn in by the cookie dough and sprinkles. This section came topped with a full size Circus Animal Cookie as well. Circus Animal Cookie: Close Up. "Made with circus animal cookies, (eggless) cookie dough, and rainbow sprinkles." I ... didn't love it though. The base I think was much of the problem. I thought it was kinda icy when I tried the sample, and it was no different once mixed. Much more standard froyo. Kinda icy, not smooth, vanilla. But the real reason I didn't love it was it was just too sweet. I loved the crunchy bits inside, from everything, the chopped up cookies, the sprinkles, and the cookie dough. I adored the bits of cookie dough. But ... it was just too sweet. Oreo Cookie Magic: "Made with oreos, (eggless) cookie dough, and rainbow sprinkles!" This was the first one I tried, and it was really quite good. I was shocked, actually. Creamy, chocolately, and the texture from the sprinkles was awesome. This was one of the daily flavors, it came out of a machine this way, which I've just never seen with soft serve before, and honestly loved! Salted Caramel Chip: "Made with sea salt, caramel, and guittard chocolate chips." The guy accidentally made a sample of this when he meant to do a different one for someone else, but it was another flavor I was interested in, so I said I'd take it (he was about to throw it out!). It too was great, creamy, sweet, loved the texture from the mix-ins. (Non Dairy) Peanut Butter Pretzels: "Made with natural peanut butter, organic soy milk, Guittard chocolate chips and pretzels." This was very, very rich. Amazingly creamy, but the peanut butter made it a heavy choice. I didn't really detect the pretzels nor the chocolate chips, which was too bad, as I was looking forward to both the salty pretzel element, and the chocolate/peanut butter combo. I also didn't taste the soy. Really, this was just very rich peanut butter ice cream to me, and I think would make an excellent base. I *still* haven't ever been able to get my act together to get a reservation for Lihiliho Yacht Club. Every time I have a reason to go, I try to make a reservation, and it is fully booked. 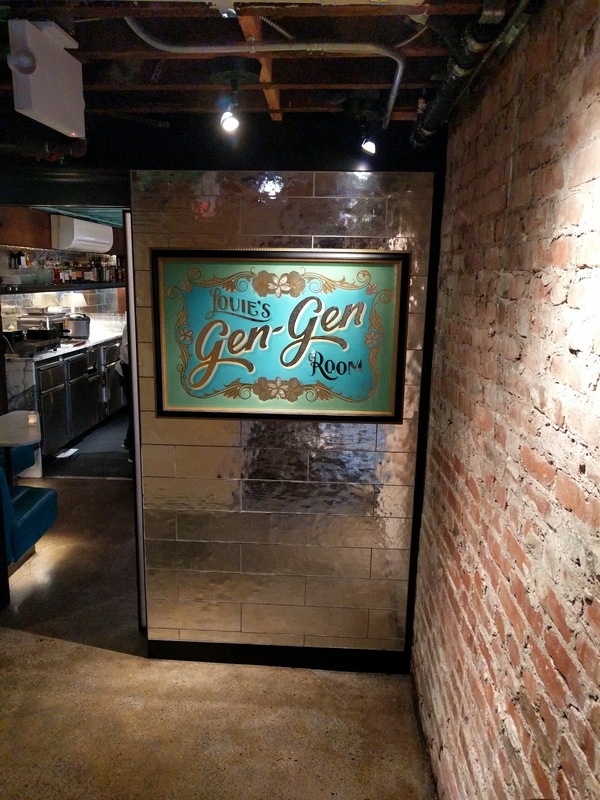 The same has historically been true for Louie's Gen-Gen Room, the cocktail bar hiding in the basement. Yes, even a couple weeks in advance, I haven't been able to get a reservation there either! But when I had a visitor in town recently, I finally did, likely as we were going for an early dinner, on a Monday evening, only 3 of us. I really enjoyed more than half the dishes we ordered. Some serious highlights. I'll gladly return, and even more gladly, finally get in to Lihiliho! Louie's Gen-Gen Room is located in the basement of Lihiliho Yaucht Club. I can't quite define the style ... uh, modern island basement vibe? Finding Louie's Gen-Gen Room is not obvious. There is no signage on the street. No signage inside. I checked in at the hostess stand for Lihiliho hesitantly, unsure of where I should be. We were given instructions to walk through the whole restaurant, through to the back, and then down some stairs. 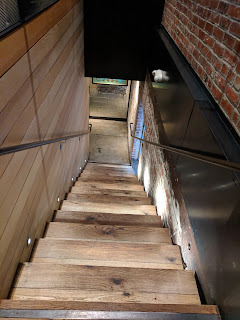 The stairwell was actually nice, it didn't feel like heading into a dingy basement. And at the bottom, finally, a sign we were in the right place. I was shocked when I saw how tiny it was. A small bar, 3 standing tables along the wall. 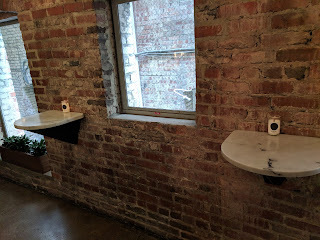 The standing tables were marble, facing into the brick walls. Basement vibe, but a nice one. 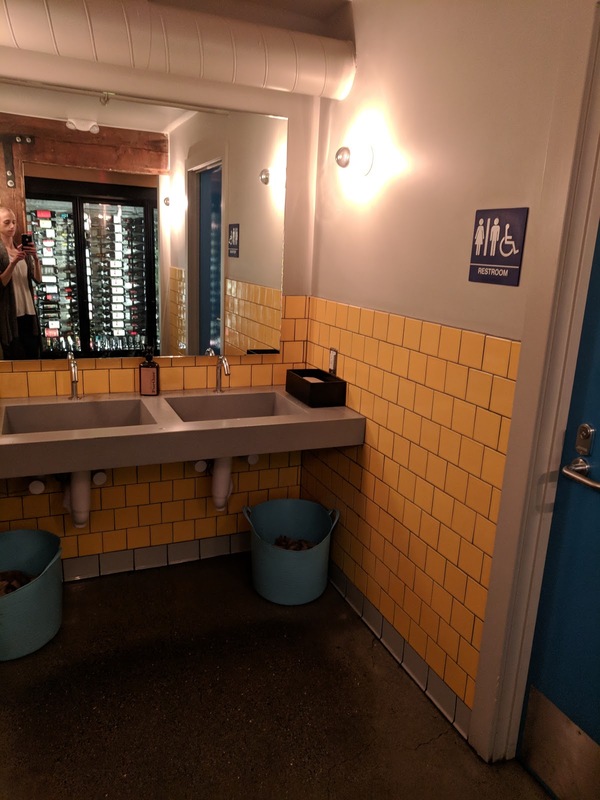 I believe this area is for walk-ins. And then, the main seating. The same white marble tables, but full (albeit small), rounds. 4 tables of 2, 3 tables of 4, although all made of small tables so I'm sure they can re-configure as needed. 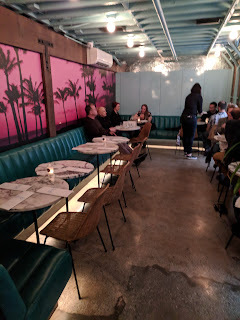 This area did have a bit of an island vibe, turquoise benches, palm trees on the wallpaper. All reservation based. About half the tables while we were here were couples just having a drink and small snack before moving up to the restaurant, the other half, like us, were there to dine. 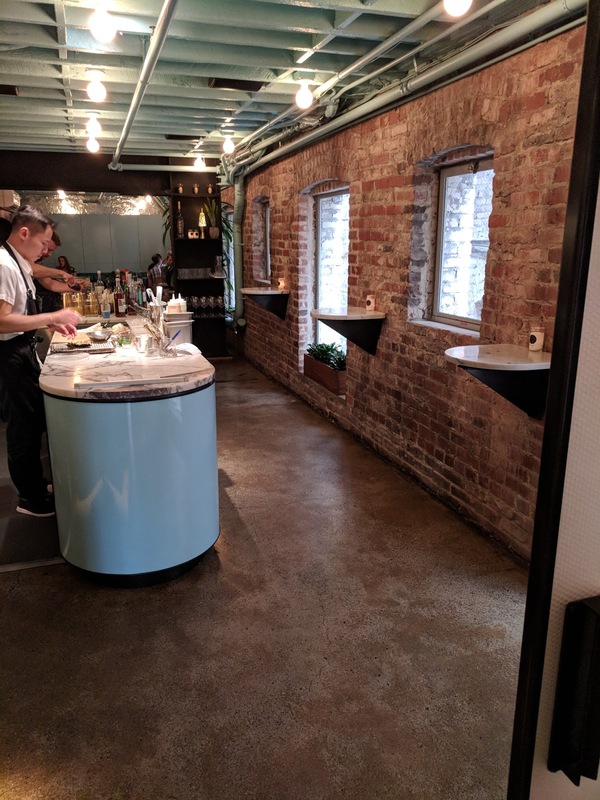 The bar and kitchen are in the same small space, with half the area occupied by each, each with a single staff member working it. The kitchen was a thing of wonder. It featured ... yes, a toaster oven and waffle iron. 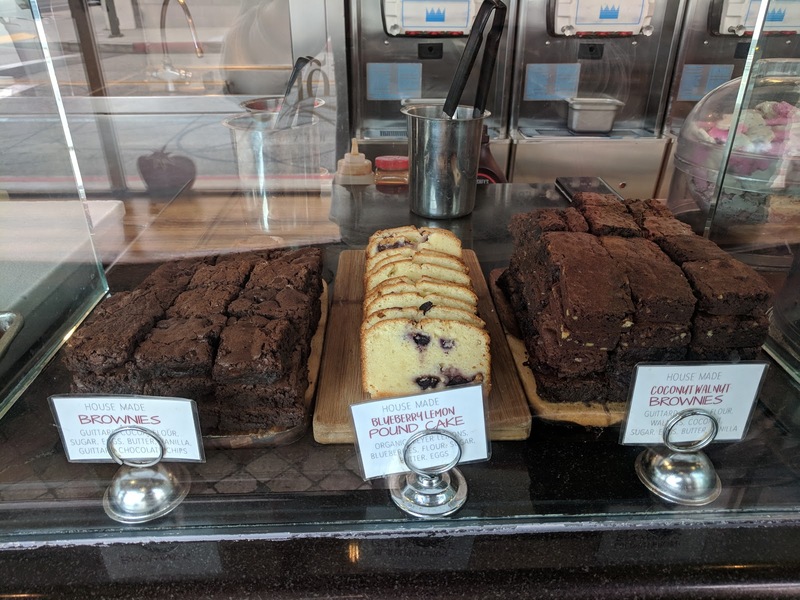 Which basically resembles my kitchen (I literally have half my stove burners covered up with butcher block cutting boards with my waffle iron on top ...), and, um, they have the same (amazing) toaster oven I do too! 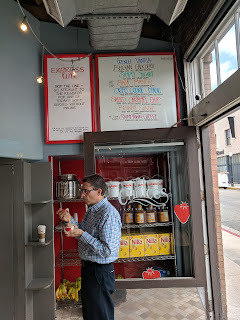 Reflecting on the menu, I realized that everything truly could be prepared (ok, finished) in this space - all room temp or chilled items, items simply needing heating, or, waffles. No wonder the menu appealed so much to me, this is my style of "cooking"! 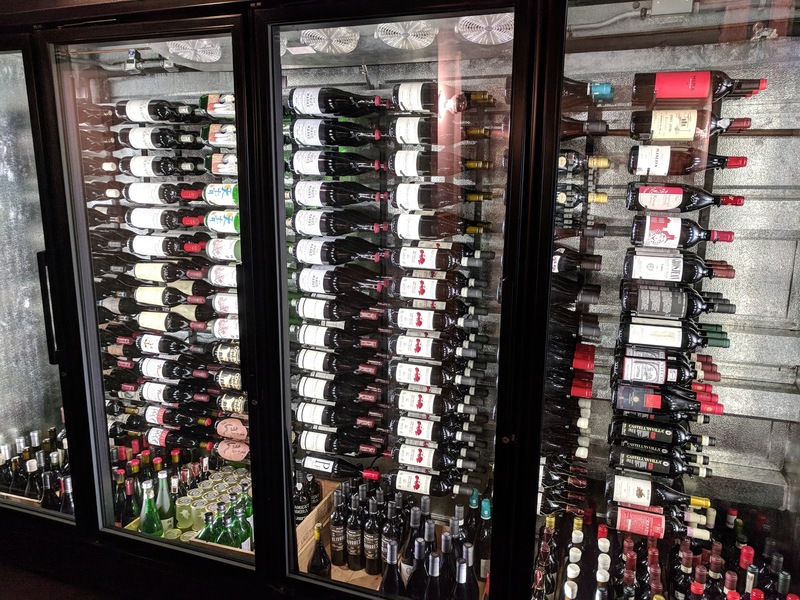 En route to the bathroom is the wine cellar for both establishments. Appropriately in a basement? A call out to the bathroom just because it is a true non-gendered restroom, two individual rooms with full size doors for the stalls, shared hand washing station. The bright island colors continue here as well. As I described, half the kitchen/bar is, well, the bar. So cocktails are a big part of the program, along with a decent spirit, and obviously wine, list. 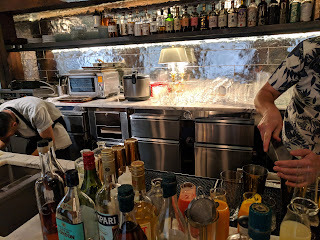 Since the bar is such a focal point, I wanted to go for a cocktail. 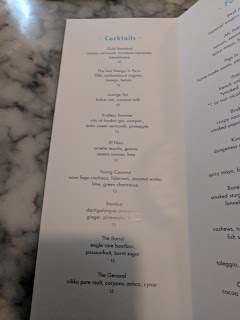 The menu had a bunch of great sounding options, interesting, diverse ingredients, particularly "island" ingredients like guava, mango, pineapple, and passionfruit. One thing missing was decent non-alcoholic cocktails. They could only make 2 drinks, both quite fruity. 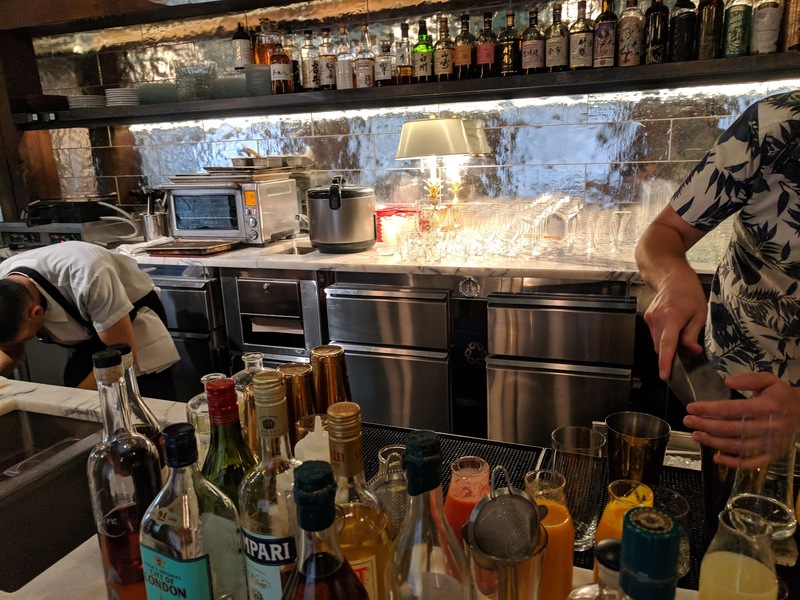 The server, and the bartender, were not interested in doing anything different. "Novo fogo cachaca, falernum, coconut water, lime, green chartreuse." 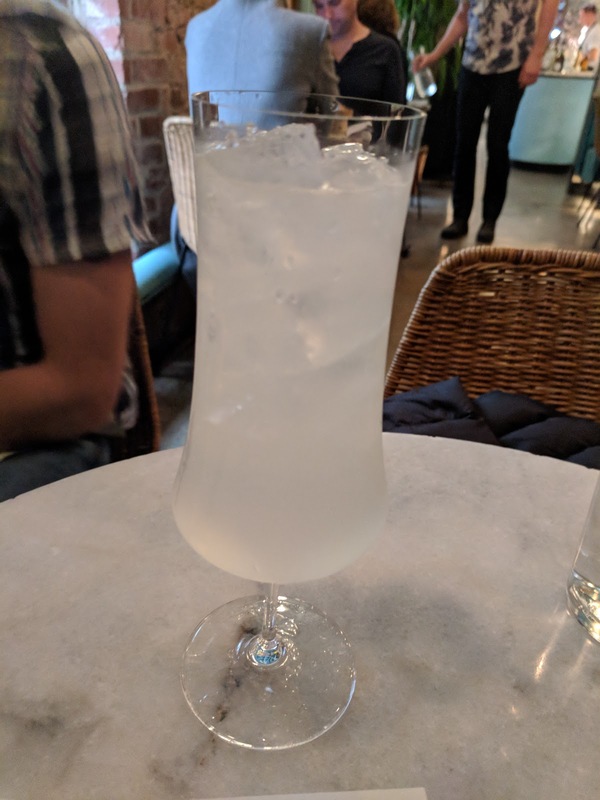 For a cocktail, I went for something a bit different from my normal bourbon, scotch, or tequila choices. I was ... uh, a bit hungover from an epic night before, and really wanted something lighter. This was indeed what I was looking for. Very refreshing, a touch sweet from the falernum, and then ... yup, chartreuse! No mistaking that. The right selection for me, for the night. 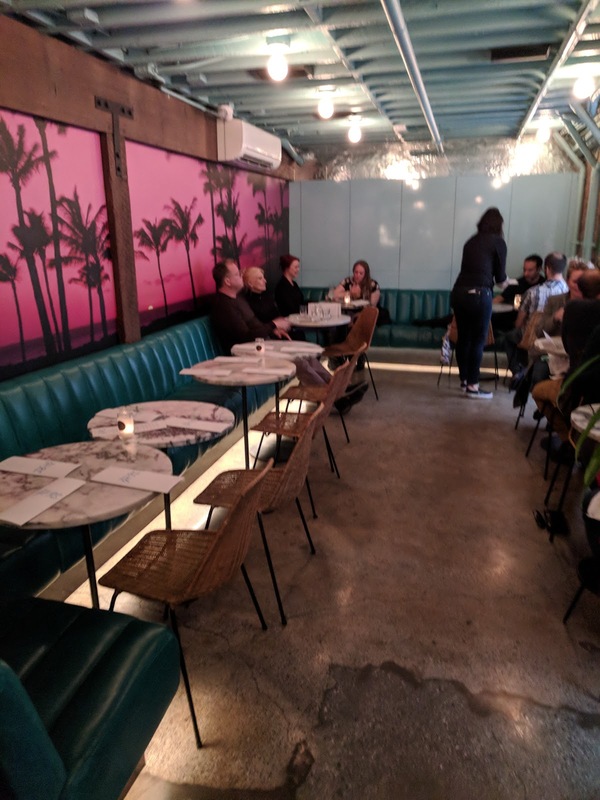 The food is all share style, all sorta bar snacks, but all breaking the mold in some way. The food menu is not extensive, and fits on a single page. 10 total savory, 2 sweet. We skipped only three savory items: the one of the two poke dishes (ahi, but it has avocado which i'm allergic to), the actual avocado dish (their play on avocado toast but with crispy nori as a base, again, because of the avocado), and the kimchi-cheese dip (it has crab, which sounded good, but we were cheese'd out). And ... shockingly for me, we skipped both sweets. One was ruled out since it has caffeine (coffee milk and cocoa nibs) and the other was a cardamom and citrus cheesecake ... which just isn't really my thing. I really wish we could have ordered dessert from upstairs though ... I've been drooling over that dessert menu! Food came one dish at a time, generally quite fast, the chilled items faster than cooked. It was easy to opt to add more as we wanted it. Since we weren't sure what portions would be like, we actually only started with 4 dishes, then added on 2 more, and then a final one. First up was a room temp item, a chilled item, one toaster oven item, and one waffled item. Full spectrum of the menu. 3 of my top 4 items were in this round, which somewhat makes sense, as I ordered according to what I wanted most. We started with the beef jerky, which arrived faster than our cocktails even. It is a room temp item and was just put on a plate, so no prep required, but I still shocked at the speed. I've realized that I just don't like 5 spice. 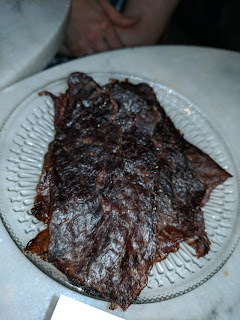 Otherwise, this was fine jerky, decent chew to it, but I didn't care for the spicing. My second to least favorite dish, but the others liked it (it was one diner's second favorite item), and it was a nice simple protein option. "French onion, egg, chives, smoked trout caviar." Very quickly following came their version of chips and dip ... or their version of classic caviar service. However you want to think of it. Fusion time. My fellow diners were a bit confused why I wanted to order the "potato chips", but I tried to explain it wasn't what they were thinking. House made potato chips, with dip served in the caviar jar. Cute touch. As was the traditional mother of pearl spoon to scoop it onto the chips. The chips were fine, fresh enough, crisp, not oily. 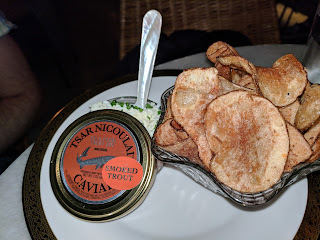 We opted for the smoked trout version, but this is also available with real caviar, if you prefer, for $48.36. Both versions use Tsar Nicoulai. Here you can see the composition of the dip: trout roe on the bottom, french onion creme fraiche, chopped egg, a sprinkle of chives. The layers of the dip/spread worked really well. Great smoke and saltiness from the roe, creaminess from the french onion creme fraiche, and lots of onion flavor. Tasty, flavorful, quite good. Top pick for one diner, my 4th pick, something I'd gladly have again, but don't feel compelled to "need" it. Pigs In A Blanket. 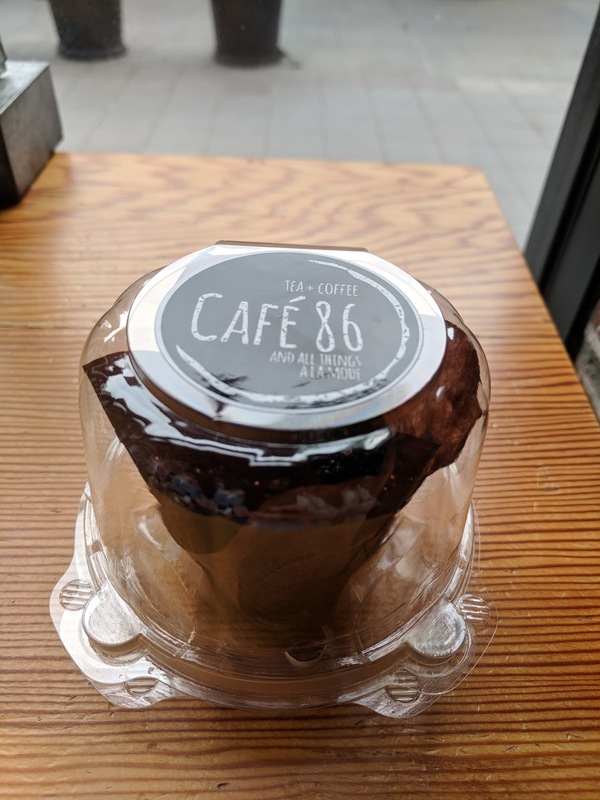 $9.88. "Home made spam, pepperjack, dijonaise." A moment later ... yes, pigs in a blanket. Hot, fresh, bubbling ... yup, fresh from the toaster oven! Of course, these are not standard pigs in a blanket. They had house made spam in place of the hot dog. The puff pastry was sprinkled with furikake. They had ... cheese. Oozing out. Oh yes. There were two items I was very excited for, on my "must have" list, and this was one of them. The pastry was buttery and slightly crisp, and as someone who adores furikake (I sprinkle this stuff on everything! Seriously, try adding it to your Caesar salad in particular, life changing), I was thrilled to see it there. The spam was a great improvement on a hot dog, much better flavor, good firm texture. The cheese was pepperjack, which I'd never normally pick (I'm team "Meh" on jack cheese in general), but it did work here, and melted beautifully. It also provided a tiny bit of kick. 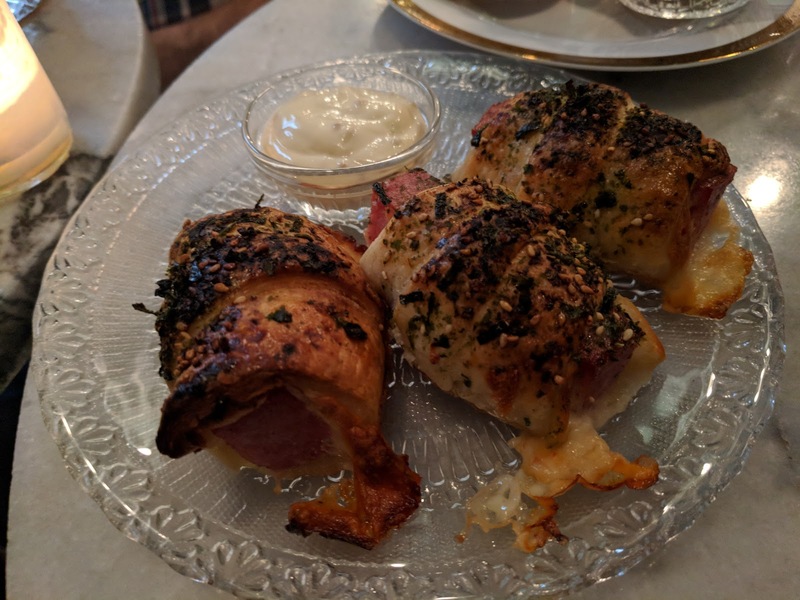 The only thing I didn't quite like was the dijonaise, which is a bit funny, as I love my mayo/aiolis, I love dipping sauces. But here it kinda overwhelmed everything else, too much mayo flavor. I preferred my pig without the dijonaise, but I actually think an island style ketchup would work better (Filipino banana ketchup I think would be great, or even a Hawaiian bbq sauce). An order normally has only 2 pigs in a blanket, but our server asked if we would like 3. The bill came with a normal order and an order of just 1, and I appreciated that they offered, and suggested, this. My 3rd pick of the night, a very nice item, but not as unique as my top two choices. I'd still gladly get them again. Bone Marrow Butter Waffle. $13.78. "Smoked sturgeon, avocado green goddess, fennel, everything spice." Given my .... obsession with waffles (or generally more specifically waffling leftovers), it should come as no surprise that the savory waffle was on my "Must Order" list (there is also a dessert waffle, and a waffle masquerading as a grilled cheese, keep reading for that!). It came cut already into 4 portions, very easy to split. So yes, a bone marrow butter waffle. Entirely a savory item, no question. The shaved fennel, pickled red onion, and everything spice on top ensured you were not tricked into thinking this was a dessert. 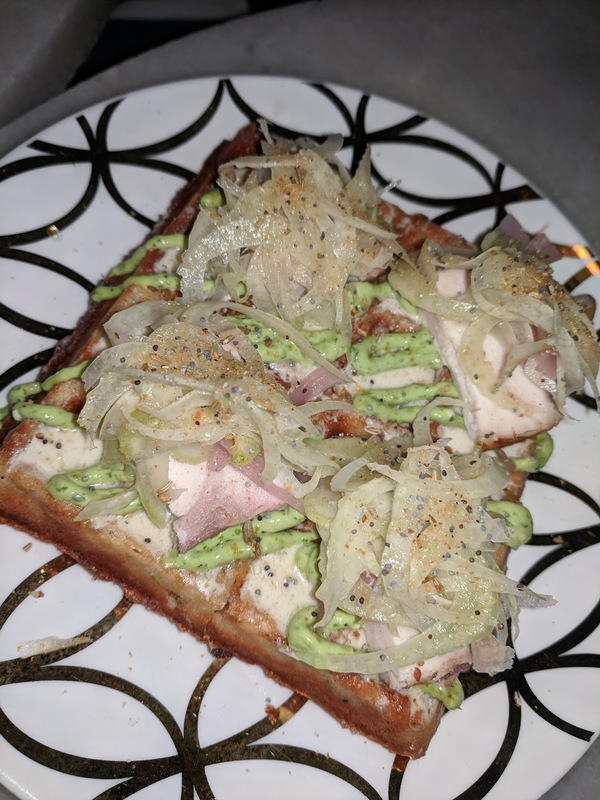 Strong flavors, yet fresh, and the fennel gave a touch of lightness to what was otherwise a very heavy dish. Under the fennel was smoked sturgeon, a chunk on each quadrant. Slightly smoky, firm, fish. Not particularly remarkable, and I'm still not entirely sold on it being the right thing to be there, but, hey, protein? Under that was two layers of sauces. The entire thing was spread with a creamy white substance that I was confused by at first. What was it? It turned out to be bone marrow butter. Lots of rich, decadent bone marrow butter. It was great. Drizzled on top of that was the green goddess, which I attempted to avoid but failed, since I'm allergic to avocado (not *horribly* allergic, but, one quadrant's worth of drizzle was about as much as I should ever have). And then, the perfectly crispy waffle. I'm not sure exactly what the batter is, as I really thought I tasted something almost corn meal like. Slight grit, slight interesting flavor and texture. Put it all together, and you get a very rich, very fascinating, savory waffle. Creamy, crispy, decadent, great (if only it had no avocado!). This was wonderful, but only my second pick of the night. I'd gladly have it again though. Since we needed more, we added on at this point. No one had strong preferences on what to order, so I asked our server if she had any must-haves. She suggested one of the pokes, so we went for one of those, thinking a lighter option would be a nice balance after the cheesy pigs in a blanket and the very decadent bone marrow waffle. And ... uh, we ordered the grilled cheese. Forget what I said about balance. 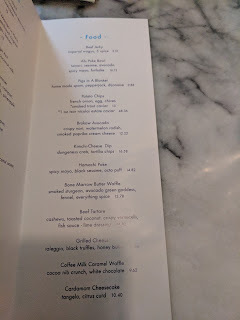 And, correction: *I* ordered the grilled cheese, the others were leaning more towards beef tartar, cheesy crab dip, etc. Who orders grilled cheese anyway? Answer: me, and I'm glad we did. "Spicy mayo, black sesame, octo puff." 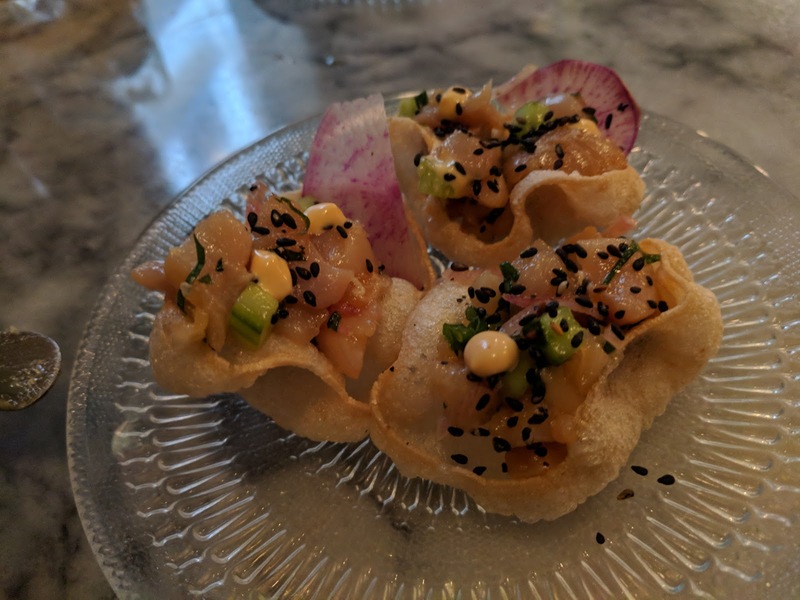 I've been kinda sick of raw fish recently, so I actually skipped this one, especially as I was filling up and had my eyes on the grilled cheese. Presentation wise though it was nice, served in crispy puff cups, and garnished with black sesame, sliced radish, and a dot of spicy mayo. The other two diners seemed to like it, opting to split the 3rd portion so they could both have more. "Taleggio, black truffles, honey butter." And then ... the grilled cheese. Also cut into 4 chunks already for us, like the other waffle. Yes, that is a grilled cheese. Yes, it is a waffle. This restaurant speaks my language, like I said. Why else would I order a grilled cheese? I knew what this would be, even if the others were a bit skeptical why I kept insisting we get the grilled cheese. 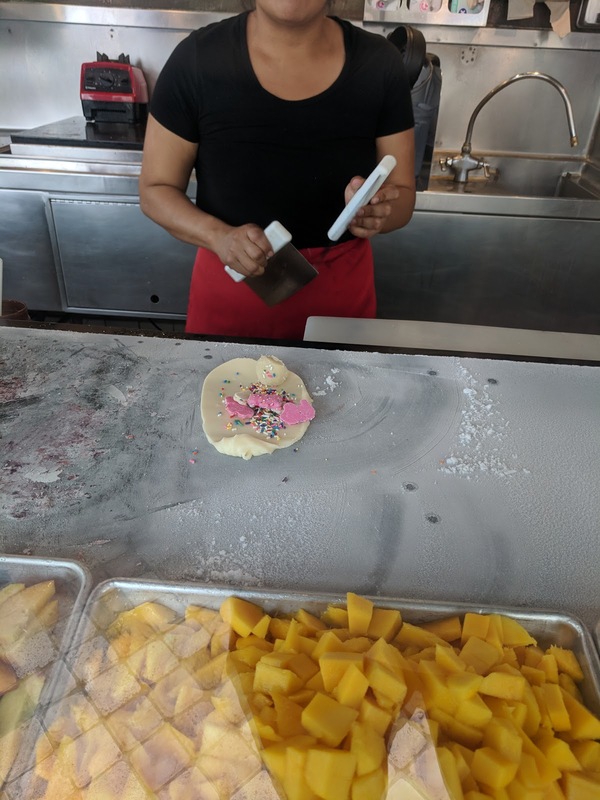 It was made with bread, not waffle dough. Perfectly crispy. Topped with shaved black truffle and finely shaved taleggio. The truffle, while not overly generous, was detectable throughout. And inside? Ooey, gooey, perfectly hot, stringy in a fun way, perfectly melted cheese. Glorious, glorious cheese. And honey butter, which I assume was also spread on the outside, giving it the extra crispy exterior. It was sweet from the honey. It was salty from the taleggio. 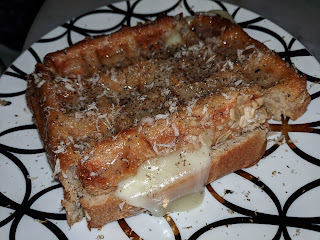 It was savory from the bread, the truffle, and the cheese. It was hot. It was crisp. It was gooey. It was ... insanely decadent. So much cheese, so much honey butter, so much goodness. I really adored this, the flavors and textures worked well together, and it was clearly a dish they have perfected. Execution-wise? #nailedIt My favorite dish of the night, and I'd return just for that any time. At this point, we wanted just one more thing. Normally, I'm all about desserts. 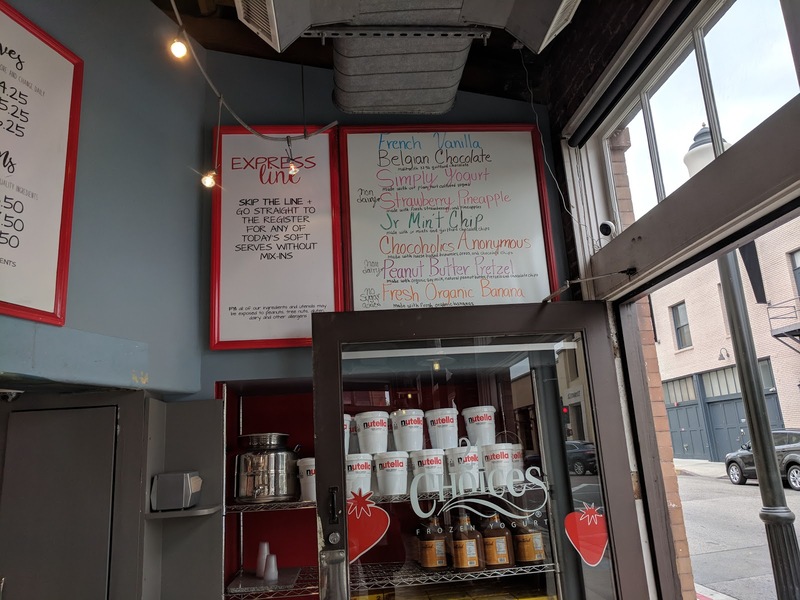 But ... since we couldn't have the dessert waffle (caffeine in the coffee milk caramel and cocoa nibs) and the cheesecake wasn't appealing to me (cardamom and citrus), we had to do something else. I tried (unsuccessfully, but I figured it was worth asking!) to order a dessert from upstairs, but alas, nope. And honestly, I was pretty satisfied with the other two waffles as quasi dessert items anyway. 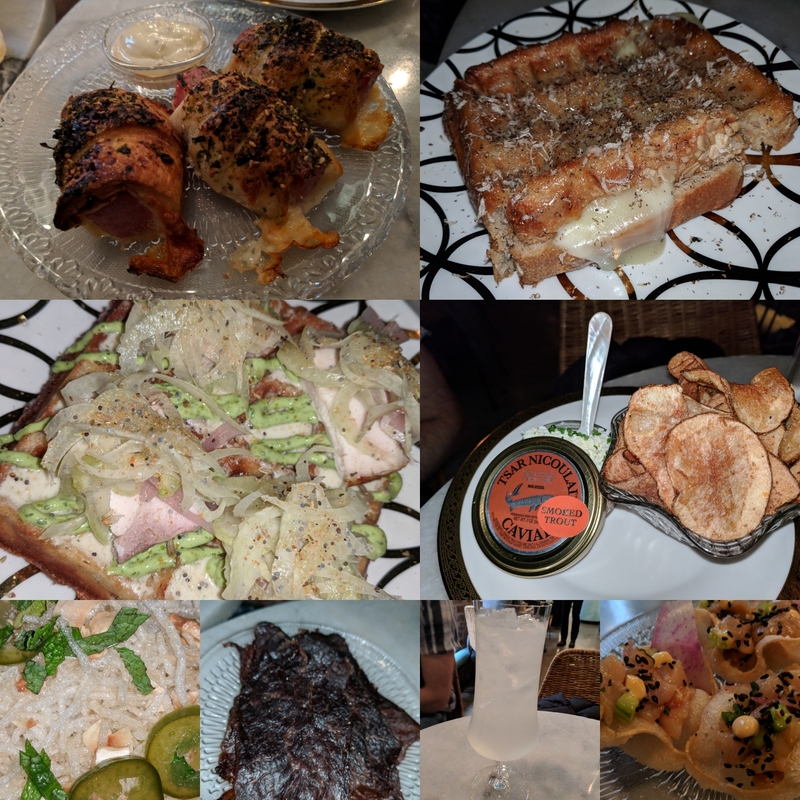 The bone marrow waffle was actually entirely savory, but the honey in the grilled cheese gave it a slight dessert feel, probably not enough for me to normally feel like my dessert sweet tooth was satisfied, but, I had been at a gala the night before with literally ... 30? 40? 50? dessert bites, and let's just say I may have over indulged. And I may have had some more waiting for me at home. So, we got a final savory item, the one the others wanted the most. "Cashews, toasted coconut, crispy vermicelli, fish sauce - lime dressing." 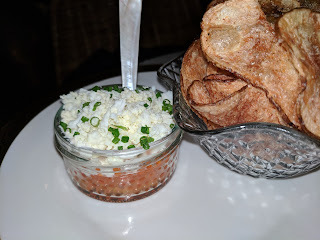 I'm not generally one for tartare, but like I said, I was pretty satisfied. 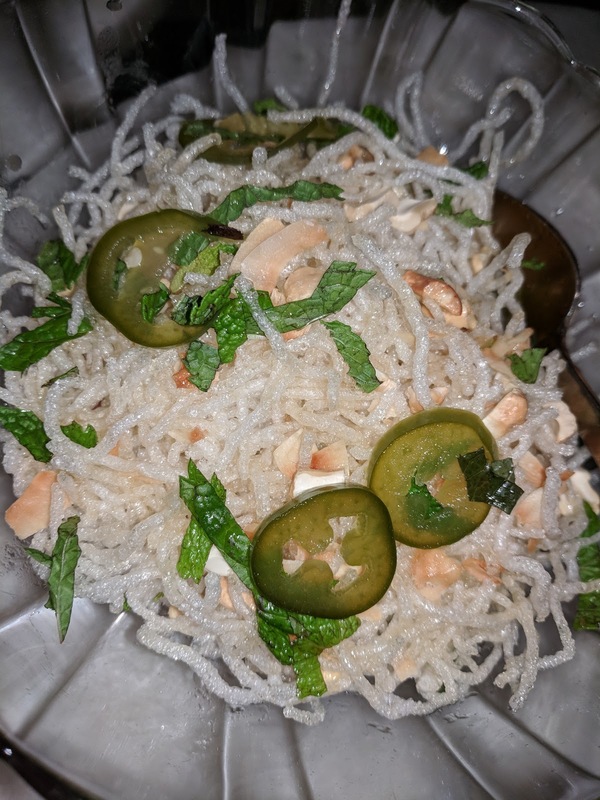 Plus, the nuts and coconut sounded unique, and I do love fish sauce. We were instructed very clearly to give this a big stir. Which was quite necessary, as the top was all vermicelli noodles, and the beef was hiding under it all. I didn't care for this. There was far more vermicelli than beef, which came as tiny cubes. It was like a crispy noodle salad with some cubes of raw beef as a garnish, rather than a beef forward dish. And the noodles got soggy nearly immediately. One other diner also didn't care for it, "Wow, I really didn't like that", was all he said, and didn't take a second bite, but the other happily just ate it all. Least favorite dish for two of us, and the only one I'd say was actually unsuccessful. Ube. Taro. Yucca. Plantains. I love these things, and need more of them in my life. 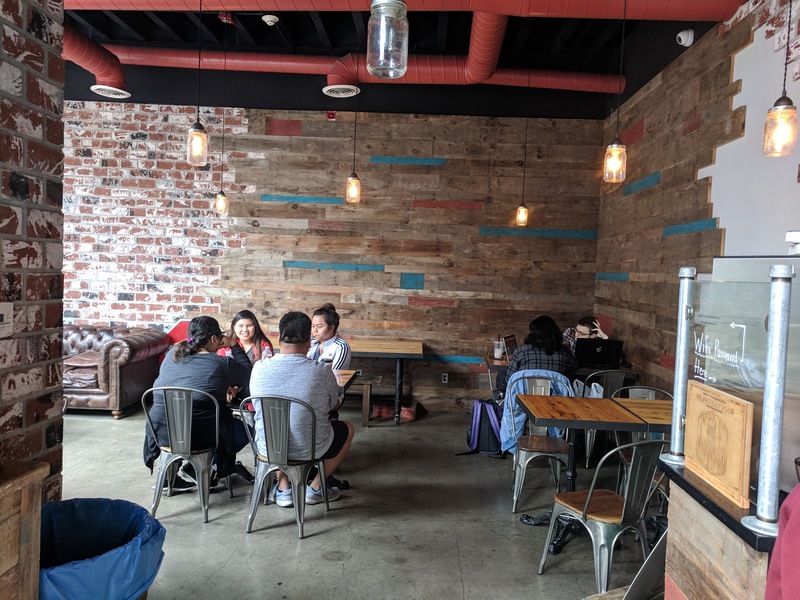 Cafe 86 is a Filipino cafe in Pasadena, offering up a slew of ube treats. Its a small place, mom and pop style, with clearly a small baking facility. 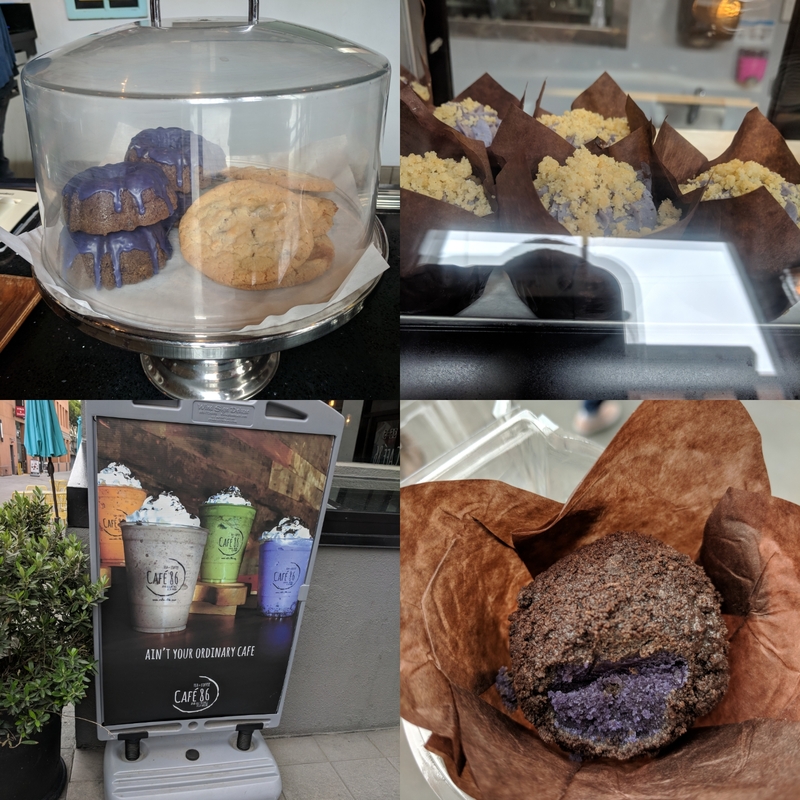 The menu of ube baked goods is *amazing*, but, each item is only offered 1-2 days a week, with only ~3 items per day. And they sell out. Fast. I went twice, both times failing to get an item I really wanted. My first visit was on Thursday seeking out the ube tres leches, which, I got to see ... but not try, as the guy before me, literally, bought THE LAST ONE! "Oh, you have a tres leches left? Excellent! Its got my name on it." I almost begged him to split it. So I went back the next day to see the Friday lineup, and settled on a truffle. It wasn't a great choice. I really, really, really wanted that ube bread pudding, as I adore bread pudding so much, but I was not in town on a Sunday, the sole day it is offered, so, it was a non-option. 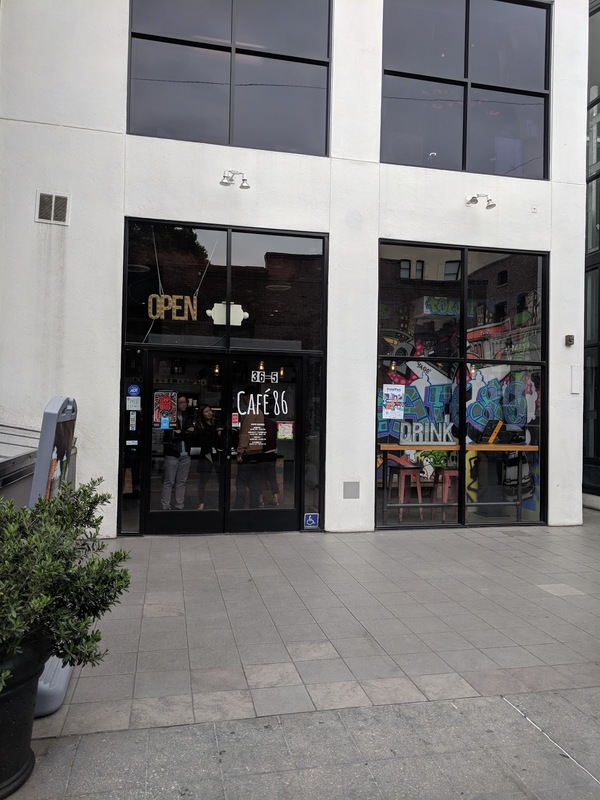 Cafe 86 is located in Old Town Pasadena, down a side alley off Colorado Boulevard. There is not much curb appeal, and it would be easy to walk past, but I knew to seek it out. 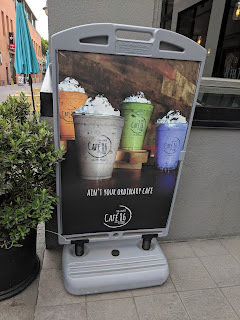 I did laugh at the "Ain't your ordinary cafe" sign out front, with colorful milkshakes topped with plenty of whipped cream. 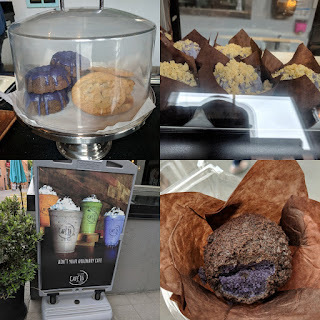 The purple one of course is the signature "Ube Monster", displayed here with the cookies n cream inspired "Kouki Monster" (say it outloud), the Matcha Monster, and Thai Tea Monster. If the weather were more appropriate, that Ube Monster had my name on it. 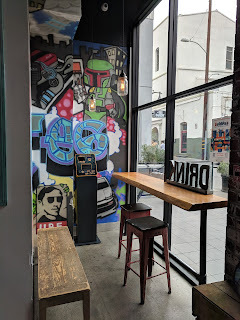 Inside feels like a comfortable welcoming cafe, with concrete slab floors, exposed brick and wood walls, exposed pipes in the high ceilings. Tables, a few couches, and free public wifi passwords on display. They clearly welcome folks coming to hang out, even though the space isn't large. Along the high full windows is a few counter seats, for individuals or those just quickly grabbing something. All food is ordered at a register, which is also where drinks are made, staffed by a single person. It doesn't move quickly, but that goes along with the feel of the place, folks here are not in a rush, they are there to enjoy. 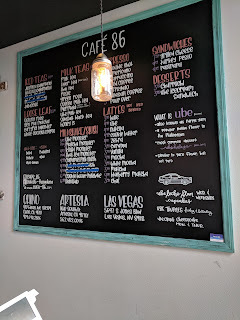 The cafe, although known for the rare ube offerings, is actually more focused on drinks, than the baked goods I was after. The menu is hand written on an appealing chalkboard, filled mostly with the drink offerings (iced tea, hot tea, milk tea, milkshakes, slushes, espresso beverages, lattes). Food offerings here only include 3 sandwiches, and 2 desserts that are always offered, and then a couple ube items daily. The menu also includes a helpful note on "What is Ube? ", to educate those unfamiliar. So, take note. If you want the Ube Crack Cheesecake, go on Monday or Thursday. Ube Leche Flan Cupcakes? Wed and Weekends. Ube Tres Leches? Thursday only. Ube truffles? Exclusive to Fri and Saturday. And the coveted ube bread pudding? Alas, only Sundays. I hear Ube and Turon pop tarts show up from time to time, as does a "Ube Crack Pie", but I'm not sure when. 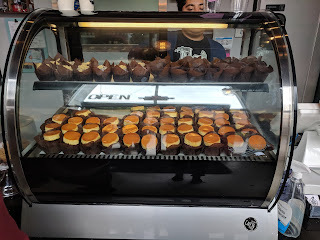 The baked goods are in a display case, none labelled with what they are, nor prices. On this day, a Friday, the case contained Ube Crack Cheesecake, Ube Truffles, and Red Velvet Flan Cupcakes. On other days, they also offer an Ube version of this ridiculous creation, yes, a cupcake, with a flan on top instead of frosting. 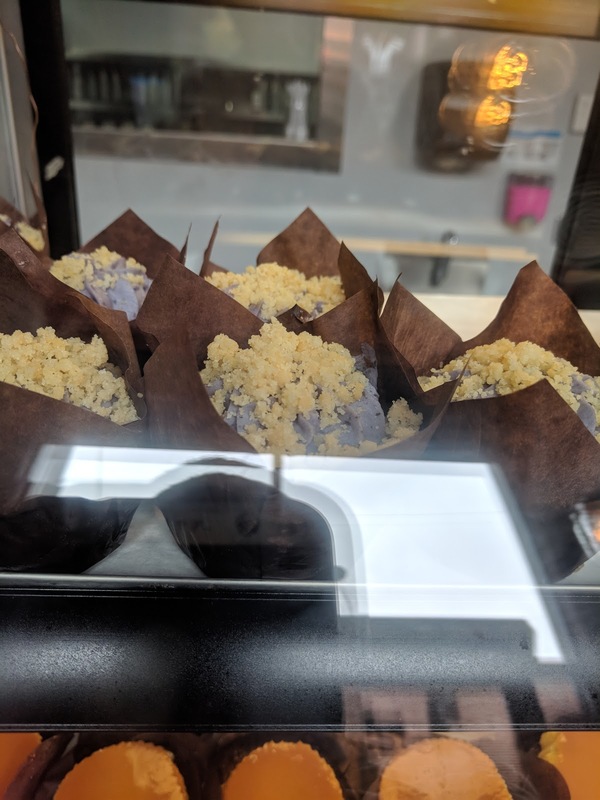 The "Ube Crack Cheesecake" is a ube cheesecake, topped with some ube frosting, and crumbs of some sort. It looked interesting, but I wasn't in the mood for cheesecake. The brownie/bar selection changes often, but I believe this was the "Slutty Brownie", with an Oreo brownie base and chocolate chip cookie bar top. 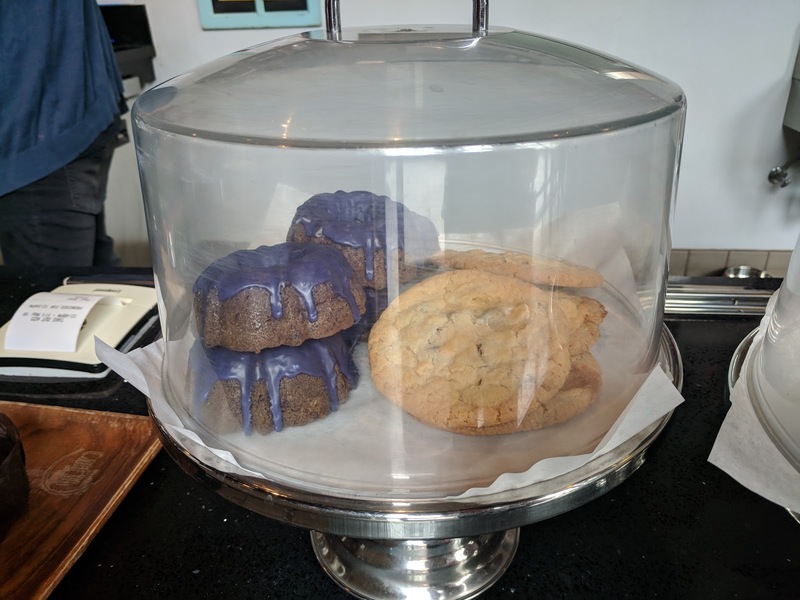 The ube glazed bundt cake wasn't interesting to me because i don't really care for bundt cake, and I"m not sure what type of cookie this was. I opted for an ube truffle, not seeing anything else I really wanted that much, sadly. Just, bad timing. 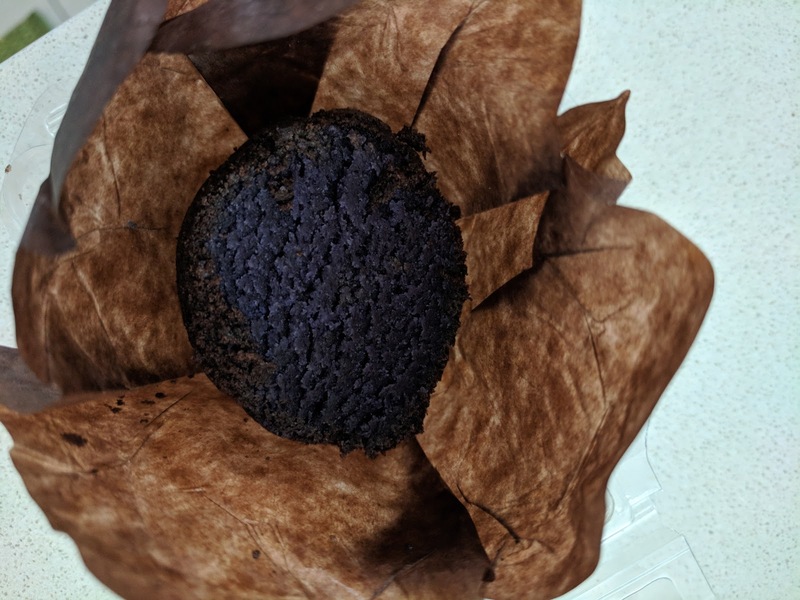 It was huge, and came in a special plastic container that looked meant to hold a cupcake or muffin (which helps give an idea how large it is). I didn't actually know what it was, as "Truffle" can mean so many things these days. 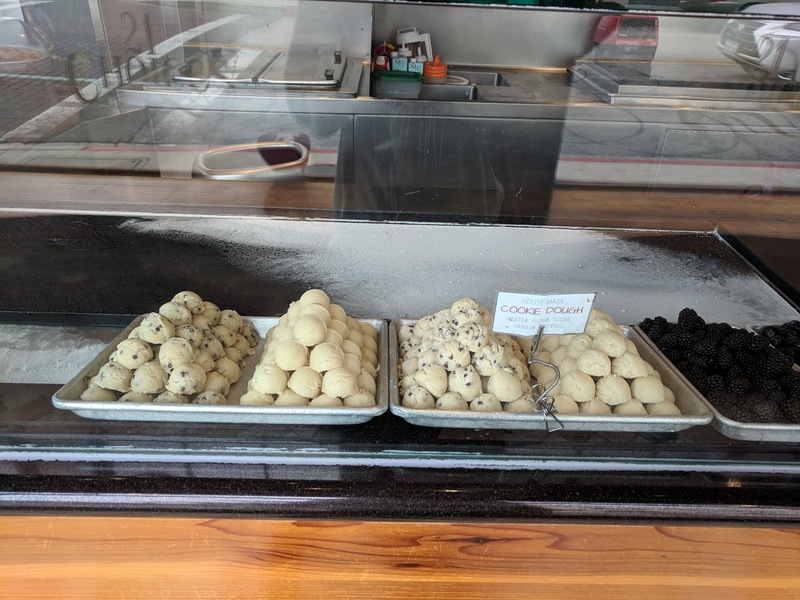 They seemed to mean "cake truffle", like the ones I had at Momofuku Milk Bar, and just like those, require refrigeration if you want to keep them a day or two. They are however at least 3-4 times the size! Anyway, the truffles are cube cake mixed with white chocolate, rolled in Oreo coating. From the outside, the color is dark brown from the Oreo crumbs, and only once you cut/bite into it can you find the purple ube. I ... didn't really like it. It wasn't *bad* but I also just didn't get the ube hit I was looking for. But mostly, I just don't like Oreo crumb! Any time cookie crumb shows up on things these days I dislike it. I love textures, but it always just feels gritty and wrong to me, and I don't actually like the taste of Oreo cookies at all. So for me, that texture and flavor dominated the ube, unfortunately. 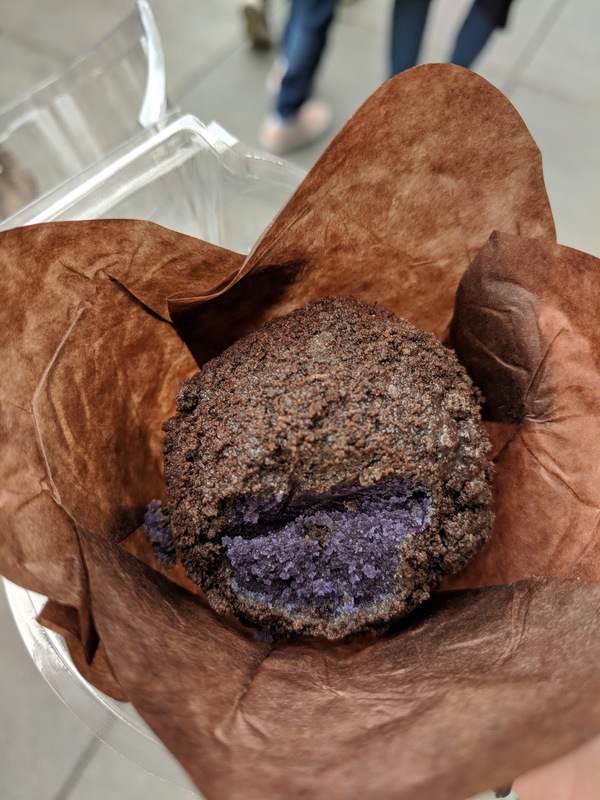 When I did just take a bite from the center, the texture was interesting, and it was sweet, but again, not much ube at all. I'd still like to return on a day when they have an item I want!